Questions about the appropriateness of new lethal injection methods have recently stayed executions in Louisiana and Ohio and caused the Florida Supreme Court to order a hearing prior to the next execution there. In Louisiana, Christopher Sepulvado received a 90-day stay to allow a federal court to determine whether the state's new protocol violates his constitutional protection against cruel and unusual punishment. He was scheduled to be executed on February 5. The Florida Supreme Court ordered a similiar hearing to be held before Paul Howell's scheduled execution on February 26 to examine the state's new protocol. In Ohio, Governor John Kasich ordered an 8-month stay of execution for Gregory Lott so the state can complete a review of its new lethal injection procedure, first used to execute Dennis McGuire on January 16, resulting in gasping and choking sounds from the inmate. The common drug in question in all three states is midazolam, a sedative used as the first drug in a 2- or 3-drug protocol. A pending federal lawsuit in Missouri asserts that a state law shrouding the makers of lethal injection drugs in secrecy is a form of prior censorship and an interference with the pulic's right to freedom of speech and freedom of the press under the First Amendment. U.S. District Court Judge Beth Phillips, who has already expressed concern about withholding this information from a death row defendant facing execution, is expected to rule soon on this broader problem. The Georgia Supreme Court is also weighing the constitutionality of a similar ban on releasing information in that state. States do not want to reveal the sources of their drugs because it might embarrass the pharmacists who are preparing the chemicals. Under Missouri's law, anyone who publishes information about the pharmacy making the drug is liable to be sued. In 2006, the St. Louis Post-Dispatch revealed that the doctor who prepared the drugs for Missouri's executions had been publicly disciplined by the state medical board, prompting the legislature to pass the secrecy law. The paper also identified a nurse on the execution team who was on probation for stalking. The editor of the Post-Dispatch later wrote, "We believe the law is unconstitutional, and we also believe it stifles public discussion and hinders governmental accountability." Just one week before the scheduled execution of Christopher Sepulvado, Louisiana announced it has been unable to find pentobarbital for its lethal injections and instead may apply a new procedure used only once before in the U.S. If the state cannot obtain pentobarbital, it will employ the two-drug procedure used by Ohio on January16 to execute Dennis McGuire, an execution that resulted in gasping sounds and movements by the inmate over an extended period of time. That procedure involved midazolam--a sedative--and hydromorphone--a painkiller. Gary Clements, an attorney for Mr. Sepulvado, said Louisiana is violating its own protocol, which requires that lethal injection drugs be obtained at least 30 days before an execution. "Just days before a scheduled execution, the State has significantly changed its execution protocol without independent oversight or public scrutiny," Clements said. "[This] once again demonstrates that the State is not prepared to move forward with Mr. Sepulvado’s scheduled execution in a manner that comports with state and federal laws, and the U.S. Constitution." Sepulvado's attorneys argue his due process rights are being violated by the lack of information about the manner of his execution, and his right to be spared cruel and unusual punishment would be violated by an execution using faulty drugs. Attorneys for a Missouri inmate facing imminent execution have asserted that the Department of Corrections has violated state and federal laws in acquiring its lethal injection drugs. Herbert Smulls is scheduled for execution on January 29, but a challenge has been filed in federal court alleging that the state's pentobarbital was obtained from a compounding pharmacy in Oklahoma, which is unlicensed in Missouri. The suit also stated the drug has not been stored properly. A correctional official, who helped find a compounding pharmacy that would sell lethal injection drugs to Missouri, said he did not know if the pharmacy was licensed to sell in the state. Cheryl Pilate, Smulls' attorney, said, "We were very surprised, really, by the lack of attention that was given to vetting the pharmacy -- finding out if it was qualified to do what it did, if it was inspected, if it was properly licensed. It seemed that there was almost no knowledge actually of the capabilities of the compounding pharmacy." In a January 22 letter to the Food and Drug Administration, Pilate alleged Missouri violated several federal laws by obtaining pentobarbital from a compounding pharmacy without a valid prescription. On January 16, Ohio carried out the first lethal injection in the U.S. using a new protocol, resulting in a lengthy and disruptive execution. Ohio employed a back-up procedure to execute Dennis McGuire, using midazolam, a sedative, and hydromorphone, a painkiller. Witnesses to the execution reported that McGuire snorted, gasped, and struggled during the execution, which took longer than usual for death to occur. 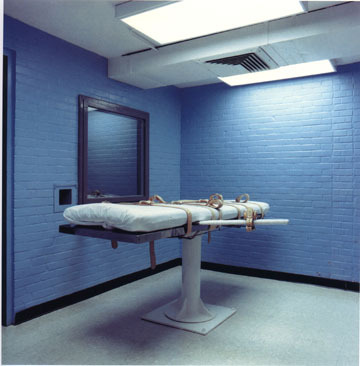 Deborah Denno, a professor at Fordham Law School and lethal injection expert, said, “Whether there were choking sounds or it was just snorting, the execution didn’t go the way it was supposed to go.” Anesthesiologists had warned that the new cocktail of drugs could cause a condition called "air hunger," in which the inmate would gasp for air but be unable to absorb oxygen. On January 9, Oklahoma executed Michael Wilson using different drugs, and the inmate on the gurney said, “I feel my whole body burning,” as the drugs began to flow. On January 10, U.S. District Court Judge Gregory Frost will consider a challenge to an execution procedure in Ohio that has never been used before in the country. Dennis McGuire is scheduled for execution on January 16, and his attorneys are arguing the new drugs could cause a very painful death, saying, "McGuire will experience the agony and terror of air hunger as he struggles to breathe for five minutes after [executioners] intravenously inject him with the execution drugs." The new lethal injection procedure will use midazolam, a sedative, and hydromorphone, a painkiller. Judge Frost has heard prior challenges to Ohio's execution procedures and has criticized the state for carrying out haphazard executions and not adequately following its own protocols.